To use moisten the Wonder Cloth sheet with water. Strip off the amount of flyline you want to clean. Pull the flyline through the Wonder Cloth and repeat until all dirt is removed. 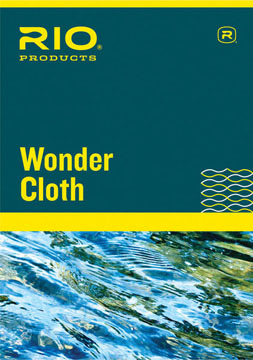 Wonder Cloths are also ideal used dry to apply dressing such as Rio AgentX. Apply, wait 5 minutes and then use Wonder Cloth to buff the line clean. Wonder Cloths can be hand washed and reused multiple times. Rio Wonder Cloth - 4 pads per pack.